"A Light for the Gentiles and the Glory of Israel"
Exactly one year ago, on January 7, 2010, for the second time in a history that spans 2,000 years, the head of the Catholic Church set foot in the synagogue of Rome. After the historical visit of John Paul II, Benedict XVI also wanted to pay homage to one of the oldest Jewish communities outside of Israel, established in the eternal city even before the first Christians arrived there. With this gesture, pope Ratzinger gave further proof of his closeness and his affection for the Jewish people. He renewed the commitment taken on by the Catholic Church almost 50 years ago, when the second Vatican Council opened a new phase in the tormented relationship between Catholics and Jews, Church and Synagogue. Tonight I wish to consider a few of the points that Pope Benedict mentioned in the speech he gave on that day. I would especially like to reflect with you on the foundations of the Jewish-Christian relationship which emerge from the Holy Scriptures. Biblical-theological research is, in fact, the essential instrument that can help us arrive to a better comprehension, not only of the other but also of ourselves. The pope has encouraged us to make this effort, saying: "our closeness and spiritual kinship find in the Holy Bible the most solid and perennial foundation, the basis upon which we are constantly placed before our common roots, the story and the rich spiritual patrimony that we share." The study of the Bible must then be complemented with historical research, to cut through the darkness which still envelops too many aspects of our common past. In the words of the Holy Father: "the Church has not failed to deplore the faults of her sons and daughters, asking forgiveness for anything that could have favored in any way the scourges of anti-Semitism and anti-Judaism." Recalling the most tragic moment of the Jewish community, the Nazi-fascist persecutions which caused a great loss of life also in Rome, he added: "the memory of these events must impel us strengthen the bonds that unite us so that understanding, respect, and acceptance may always grow and increase." Originally I had the intention of listing some events of the past which are still stumbling stones today in the Jewish-Christian dialogue. About a month ago, however, a note was released which allows me to tell the positive example of a man who, in difficult circumstances, acted as a true brother in the encounter with his fellow Jewish citizens. This case touches us in a particular way because it was precisely verified in the tuscolana diocese in which we find ourselves. On December 14, 2010, the Yad VaShem Institute of Jerusalem granted, in the Gesù residence in Rome, the "Righteous among the Nations" medal. This title commemorates those who, during the period of the Shoah, risked their own lives to save even one person. On this occasion the medal was given in memory of a Jesuit priest, fr. Raffaele Cubbe. Between 1942 and 1947, he was rector of the "Nobile Collegio di Villa Mondragone", then a boarding school for children of the higher social classes. During the occupation of Rome, especially after October 16, 1943 when the Nazis rounded up the ghetto and deported more than 1000 people to Auschwitz, many families sought refuge in the Roman flatland, also in the suburbs of Frascati. It was in these circumstances that three Jewish boys, Marco Pavoncello and the brothers Graziano and Mario Sonnino, arrived at the Collegio di Mondragone. Fr. Cubbe, well aware of their Jewish origin, welcomed them, hiding them for more than three years among the other Catholic pupils. Thanks to the heroic and disinterested help of this priest, the three boys survived the years of the war, being even able to continue their normal studies. Moreover, fr. Cubbe was always respectful of their Jewish identity, for example allowing them to observe their own dietary laws. On the day of honoring him (fr. Cubbe died in 1983), one of the three boys from then, Marco Pavoncello, recalled how was life in the college: "The atmosphere was serene. People ate, played, studied, went to church. I must say one thing: never, also in the following years, was there any attempt at conversion or any coercion; and there was never any act of anti-Semitism, neither among the boys nor among the priests." Asked about his feelings for the deceased rector, 65 years later, he said: "to recall the figure of fr. Cubbe makes me happy and emotional. The emotion derives from the memory of a terrible moment for us Jews, the nazi-fascist persecution; the happiness comes being finally able to thank a man to whom my family and I are infinitely grateful." Fr. Cubbe was an extraordinary character, a figure who, thanks to his faith and to his rich culture, knew unlike many others that Christians and Jews are members of the same family of God. I think it is important to remember this heroic gesture, not only to honor his memory, but also because his example helps us to fight ignorance and indifference which still today impede us from recognizing the brother in the face of the other. One conference cannot exhaust all the biblical testimonies on the intimate link between the Jewish people and the Church. Having to make a choice, I wish to present here some concepts which imprint themselves in our memory because of their figurative concreteness. I would like, therefore, to present three images, one taken from the Old, and the other two from the New Testament, images which - each in its own way - express the unique divine plan which embraces Jews as well as Christians: the mountain upon which all the peoples of the world come as pilgrims; the wall which at one time divided humanity, definitely torn down by Jesus Christ; and the tree, nourished by a single root, which should shine in the abundance of its leaves. The central event of the entire biblical revelation is God's encounter with man, and more precisely with a particular group of people, the people of Israel. This people, in the course of its history, discovered the laws according to which the world was created and persists, and the norms that regulate social living. Israel tried to respect these laws, not only in the ethical behavior of the individual, but especially in the life of the entire people. Daily, for many centuries, it tried to live out justice and peace between individual members of society and it discovered in this way, through successes and failures, that which God desires, his plan for the salvation of man. These experiences were written in the book of the Torah, which does not mean primarily "laws" but rather "teachings" for a successful life. However, Israel was always a small people and the world ruled by the nations was much more powerful. To build peace in a global dimension it was not sufficient that only one people practiced this alternate way of life. For this reason, those who were farsighted asked themselves: should not also the pagan nations know the fundamental rules of the Torah? Should they not also accept the teachings of God, without necessarily becoming Jews? But in which way should they come to the knowledge of the saving plan of God? Let us for a moment reflect upon this marvelous vision, upon the outstanding optimism which permeates these lines. The prophet is convinced that God is planning to extend His salvation to all the peoples of the earth! He is confident that all of humanity is heading towards a happy destiny, that peace and not war will be the last word of the human story. But by what are the nations attracted? What prompts them to undertake a tiring journey which will unite them, all together, on Mount Zion, in the capital of the people of Israel? They are not merchants in search of treasures! They are not tourists who admire the beauty of buildings and squares! It is not even the magnificent cult with the sacrifices, the processions, the chants, the splendid vestments of priests that attracts them. All these things, and more, already exist among them. The nations, instead, are looking for something that they do not find elsewhere, the place where justice is practiced, where, in social life, there is a balance between freedom and solidarity and where, under the Lordship of God, reigns a joyous peace. 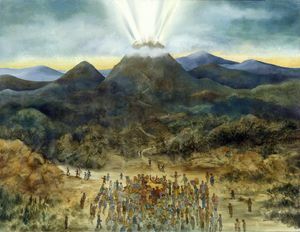 What happens to the nations once they have arrived on the mountain? They do the same thing that Israel has always done: they learn the Torah - not all the details of the law, but what is necessary to mold social relations with a new spirit. They do not convert to Judaism, but they maintain their own identity; they return home to actualize a radically different lifestyle. They no longer prepare themselves for war, because they no longer feel threatened by others who have learned the same lesson. The observance of the divine commandments have freed them from the fear which is the basis of every aggression. There is no guarantee that the other nations will accept the invitation. Nevertheless, even in the case that they might reject it, Israel should not hesitate to move forward, to already practice now this peace with the others will enjoy only at the end of time. They should live out justice within themselves and show what are the fruits of a life lived according to the principles of the Torah. The salvific plan of God is a unique one for all peoples. Nevertheless, someone must begin to receive it; he must be a pioneer, in the hope that, fascinated by his own way of living, others will follow his example. For many centuries, the vision of the prophets regarding the pilgrimage of the nations remained an unfulfilled hope. The gap between the Jewish people and the pagan nations seemed unbridgeable, and the divine plan to unite all men in one family appeared to be an utopia. For this reason, it was all the more surprising when a single man, not a priest from the Temple of Jerusalem, but a simple carpenter, citizen of the despised Galilee, succeeded in knocking down once for all the wall that divided humanity in two. Jesus was convinced that his mission was to give "bread to the children", that is, to proclaim the word of God to the people of Israel, to heal their wounds for the sake of restoring the society which reflects the divine justice and mercy. This prediction, however, would be fulfilled only after the death of Jesus, thanks to the miracle of Easter which gave birth to the community of his disciples. A multitude of people, which earlier had already appreciated the Jewish faith but hesitated to receive it with all its precepts, was now asking to enter the community. Reflecting upon the meaning of the life and death of Christ, the apostles arrived at the conclusion that they could not reject their request, they had to welcome them and teach them the way of life which they themselves had learned from Jesus.. In the following decades, the number of non-Jewish Christians increased in exponential number, to the point that it fundamentally altered the composition of the community: suddenly, there were joined together circumcised Hebrews, raised in the Jewish faith and observant of the mosaic commandments, and uncircumcised Gentiles, who were not required to observe all the commandments. We also know in which city there existed such a mixed community for the first time: Antioch in Syria. Their neighbors noticed them with amazement and called the members of the community with a new name: "Christians", the followers of Christ. Faith in Jesus Christ had generated something totally new, a new society. The two groups, until recently clearly divided - on the one hand the Jews, the chosen people, and on the other the pagans, ex-idol worshipers - were finally gathered together around the same table; they ate and prayed together, and shared all the necessities of life. The wall of separation that had lasted a millenium had been knocked down. Jesus Christ is the one who, through his total obedience to the will of the Father, through the offering of his own life, has overcome the separation between "the two," Jews and Gentiles, creating a unity and peace that were previously unimaginable. With the birth of the Christian community, composed of Jews and Gentiles, not all problems were solved. The continued existence of Jews who did not recognize Jesus as their Messiah created a serious theological problem: did the Church now form another - a second - people of God? Or did it even take the place of Israel? One single people of God or two peoples? This was the pressing question that awaited an answer. For St. Paul, the fact that so many Gentiles were converted to the God of Israel, fulfilling in this way the eschatological vision of the prophets, represented a great mystery. Finally, the Gentiles had arrived to Mount Zion from the East and the West; they had seated themselves at the table of Abraham, and had begun to learn the ways of the Lord. This, however, should not be a reason to boast, or to feel superior in respect to members of the Jewish people who had not entered the community. In order to fight this feeling of pride that often marked the new converts, the apostle, in his letter to the community of Rome, uses the image of the olive tree. In this way, he borrows a metaphor from the prophets, who had compared Israel to a green olive tree, beautiful and majestic in the fullness of its foliage (cf. Jer 11:16; Hos 14:7). Using this image, the apostle proposes a perspective which overcomes the speculations on the election of some and rejection of others. What counts are not the individual branches, but the integrity of the tree, that is, of the people of God. Just as the olive tree (a particularly long-lived tree) nourishes itself from its roots, so the people of God has deep roots: it is rooted in a long history which begins with Abraham and Sarah, passing through Moses and David, and culminating in Jesus. This root is "holy" and, therefore, so it is the tree with all its branches, that is, the individual believers (Rom 11:16). With great emphasis, St. Paul admonishes the new members of the community not to boast of the graces they have received. They should always remember that they come from a wild olive tree and, with no merit whatsoever, they were grafted into the "holy tree" of Israel. How could they rejoice in their own salvation at a time when other branches are cut off, among which the original branches? They should rather consider their own fortune as a duty of witnessing to those who do not belong to the Church. They should make an effort to demonstrate through their actions the salvation that they received, by shaping all areas of their lives according to the great commandment of love. Only this could convince the followers of Moses that in Jesus Christ the promises of the prophets are completely fulfilled. St. Paul hopes in the salvation of all Israel (Rom 11:26); he wishes that the tree turns green again in the totality of its branches to carry as much fruit as possible. We should not, therefore, be content with the present situation in which Church and Israel form two groups that are clearly distinct; we should rather see it as a sign that our faith is still lacking, that our testimony to Christ is not fully convincing. In other words: we should not be content of the grace received, but should make it shine through always more in our actions and in our words. When Mary and Joseph took Jesus to the Temple in Jerusalem, 40 days after His birth, the aged Simeon prophesied: this child would be "a light to the Gentiles and the glory of the people of Israel" (Luke 2:32). 2,000 years later, the first part of the oracle is largely accomplished: the Gospel reached the most remote corners of the earth. The second part, however, still seems far from its fulfillment: very few are the Jews look with pride upon the greatest son of their people. At the same time, among Christians the knowledge was largely lost that Jesus the Jew is the bridge who connects the Church with the Synagogue. What image could express the desired unity between Christians and Jews, between the community of the followers of Jesus and of the "people of the covenant"? During the period of Christmas, in the Basilica of Marino, one could admire a special crib: between Mary and Joseph was the baby Jesus who did not lie in the manger but was held up by a book. He is the interpreter of the Scriptures; He translated its letters into living words and actions; He accomplished everything that the Torah of Israel predicted. This image, with much simplicity, illustrates a thought of the theologian Ratzinger: Jesus is "the Torah in person," the incarnation of the Torah, the divine will become visible in the story of a man. Another picture, more sophisticated, was drawn by Joseph Schele, architect and artist who for many years, until his death, lived at Villa Cavalletti. From a small olive tree trunk he carved a cross, intended for a community which assembles around the altar for the Eucharist. The base of the cross is formed of a Torah scroll; it sustains the cross, clarifying its meaning. The cross originates from the Torah, and hangs over it, protecting it and blessing it. Both rise on a hill: Mount Sinai, where God revealed his will to the people of Israel, and at the same time Mount Golgotha, where God revealed his definitive love in the passion of Christ. This sculpture illustrates the intimate union between the Torah that was written, once for all, upon the scroll, and the one that was incarnated in the person of Jesus. It stimulates the desire of reconciliation between the two people who are called to witness together of the peace of God. I would like to conclude these reflections with a word, perhaps prophetic, which the then Cardinal Ratzinger expressed in a private correspondence in 2003. Here are his affirmations on the Church-Israel relationship: "Although God has reserved for Himself the definitive unity and - as it seems - He is keeping it for the end of time, nevertheless we must already move towards this unity and place ourselves at the service of this peace which Christ has built with his own blood." Michael P. Maier, priest and member of the Catholic Integrated Community, teaches Old Testament at the Pontifical Gregorian University in Rome and collaborates with the Chair for the Theology of the People of God at the Pontifical Lateran University.